Celebrate the Holidays at KU Medical Center! Schubert - Symphony No. 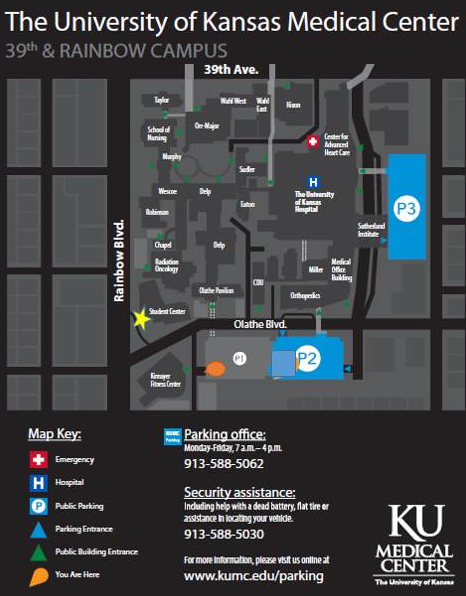 4 "Tragic"
Michael Cook- Overture - "Il Cavaliere"
Battenfeld Auditorium is located in the Student Center building at KU Medical Center (Yellow star on the map below), at the intersection of Rainbow and Olathe Blvd. It is on the southwest corner of the KU Medical Center complex on Rainbow. There is a Commerce bank across the street. Battenfeld Auditorium is just inside through the glass double doors.